There is a well-known, pre-existing definition of the term saga that has a different meaning from the one generally understood in relation to CQRS. The term process manager is a better description of the role performed by this type of code artifact. Although the term saga is often used in the context of the CQRS pattern, it has a pre-existing definition. We have chosen to use the term process manager in this guidance to avoid confusion with this pre-existing definition. The term saga, in relation to distributed systems, was originally defined in the paper "Sagas" by Hector Garcia-Molina and Kenneth Salem. This paper proposes a mechanism that it calls a saga as an alternative to using a distributed transaction for managing a long-running business process. The paper recognizes that business processes are often comprised of multiple steps, each of which involves a transaction, and that overall consistency can be achieved by grouping these individual transactions into a distributed transaction. However, in long-running business processes, using distributed transactions can impact on the performance and concurrency of the system because of the locks that must be held for the duration of the distributed transaction. The saga concept removes the need for a distributed transaction by ensuring that the transaction at each step of the business process has a defined compensating transaction. In this way, if the business process encounters an error condition and is unable to continue, it can execute the compensating transactions for the steps that have already completed. This undoes the work completed so far in the business process and maintains the consistency of the system. Although we have chosen to use the term process manager, sagas may still have a part to play in a system that implements the CQRS pattern in some of its bounded contexts. Typically, you would expect to see a process manager routing messages between aggregates within a bounded context, and you would expect to see a saga managing a long-running business process that spans multiple bounded contexts. The following section describes what we mean by the term process manager. This is the working definition we used during our CQRS journey project. For a time the team developing the Reference Implementation used the term coordinating workflow before settling on the term process manager. This pattern is described in the book "Enterprise Integration Patterns" by Gregor Hohpe and Bobby Woolf. This section outlines our definition of the term process manager. Before describing the process manager there is a brief recap of how CQRS typically uses messages to communicate between aggregates and bounded contexts. When you implement the CQRS pattern, you typically think about two types of message to exchange information within your system: commands and events. Commands are imperatives; they are requests for the system to perform a task or action. For example, "book two places on conference X" or "allocate speaker Y to room Z." Commands are usually processed just once, by a single recipient. Events are notifications; they inform interested parties that something has happened. For example, "the payment was rejected" or "seat type X was created." Notice how they use the past tense. Events are published and may have multiple subscribers. Typically, commands are sent within a bounded context. Events may have subscribers in the same bounded context as where they are published, or in other bounded contexts. The chapter, "A CQRS and ES Deep Dive" in this Reference Guide describes the differences between these two message types in detail. What is a process manager? In a complex system that you have modeled using aggregates and bounded contexts, there may be some business processes that involve multiple aggregates, or multiple aggregates in multiple bounded contexts. In these business processes multiple messages of different types are exchanged by the participating aggregates. For example, in a conference management system, the business process of purchasing seats at a conference might involve an order aggregate, a reservation aggregate, and a payment aggregate. They must all cooperate to enable a customer to complete a purchase. 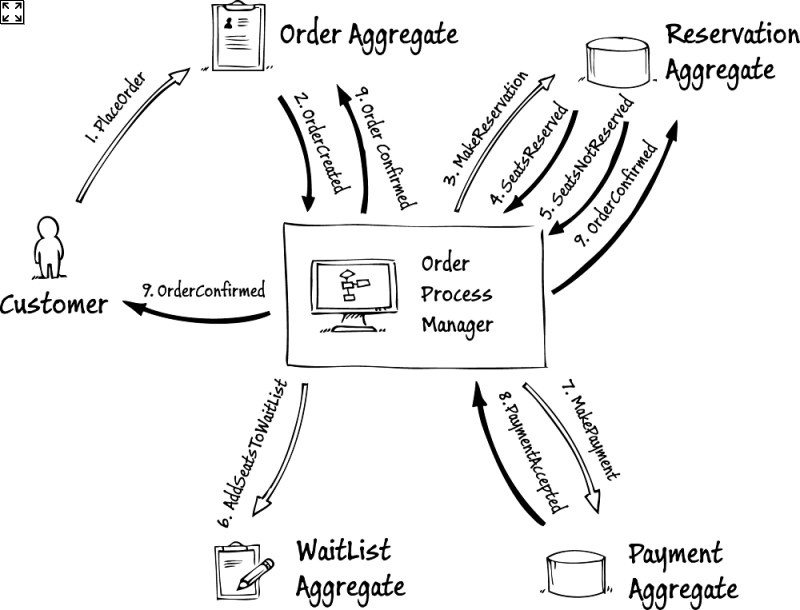 Figure 1 shows a simplified view of the messages that these aggregates might exchange to complete an order. The numbers identify the message sequence. This does not illustrate how the Reference Implementation processes orders. In the example shown in Figure 1, each aggregate sends the appropriate command to the aggregate that performs the next step in the process. The Order aggregate first sends a MakeReservation command to the Reservation aggregate to reserve the seats requested by the customer. 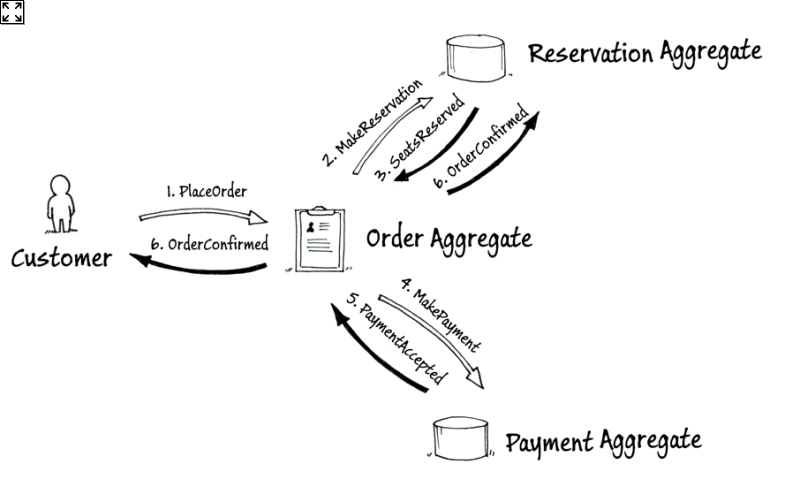 After the seats have been reserved, the Reservation aggregate raises a SeatsReserved event to notify the Order aggregate, and the Order aggregate sends a MakePayment command to the Payment aggregate. If the payment is successful, the Order aggregate raises an OrderConfirmed event to notify the Reservation aggregate that it can confirm the seat reservation, and the customer that the order is now complete. The example shown in Figure 2 illustrates the same business process as that shown in Figure 1, but this time using a process manager. Now, instead of each aggregate sending messages directly to other aggregates, the messages are mediated by the process manager. This appears to complicate the process: there is an additional object (the process manager) and a few more messages. However, there are benefits to this approach. Firstly, the aggregates no longer need to know what is the next step in the process. 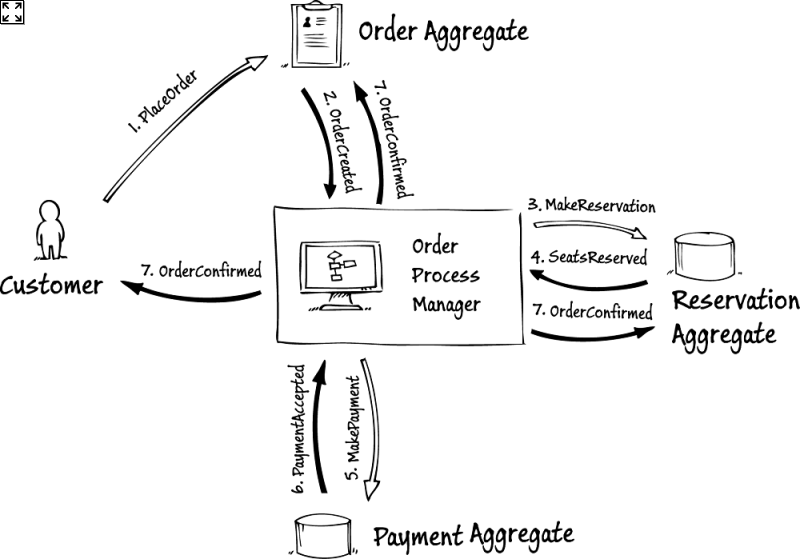 Originally, the Order aggregate needed to know that after making a reservation it should try to make a payment by sending a message to the Payment aggregate. Now, it simply needs to report that an order has been created. Secondly, the definition of the message flow is now located in a single place, the process manager, rather than being scattered throughout the aggregates. In a simple business process such as the one shown in Figure 1 and Figure 2, these benefits are marginal. However, if you have a business process that involves six aggregates and tens of messages, the benefits become more apparent. This is especially true if this is a volatile part of the system where there are frequent changes to the business process: in this scenario, the changes are likely to be localized to a limited number of objects. In Figure 3, to illustrate this point, we introduce wait listing to the process. If some of the seats requested by the customer cannot be reserved, the system adds these seat requests to a waitlist. To make this change, we modify the Reservation aggregate to raise a SeatsNotReserved event to report how many seats could not be reserved in addition to the SeatsReserved event that reports how many seats could be reserved. The process manager can then send a command to the WaitList aggregate to waitlist the unfulfilled part of the request. It's important to note that the process manager does not perform any business logic. It only routes messages, and in some cases translates between message types. For example, when it receives a SeatsNotReserved event, it sends an AddToWaitList command. When should I use a process manager? When your bounded context uses a large number of events and commands that would be difficult to manage as a collection point-to-point interactions between aggregates. When you want to make it easier to modify message routing in the bounded context. A process manager gives a single place where the routing is defined. When should I not use a process manager? You should not use a Process manager if your bounded context contains a small number of aggregate types that use a limited number of messages. You should not use a process manager to implement any business logic in your domain. Business logic belongs in the aggregate types. Although we have chosen to use the term process manager as defined earlier in this chapter, sagas may still have a part to play in a system that implements the CQRS pattern in some of its bounded contexts. Typically, you would expect to see a process manager routing messages between aggregates within a bounded context, and you would expect to see a saga managing a long-running business process that spans multiple bounded contexts.